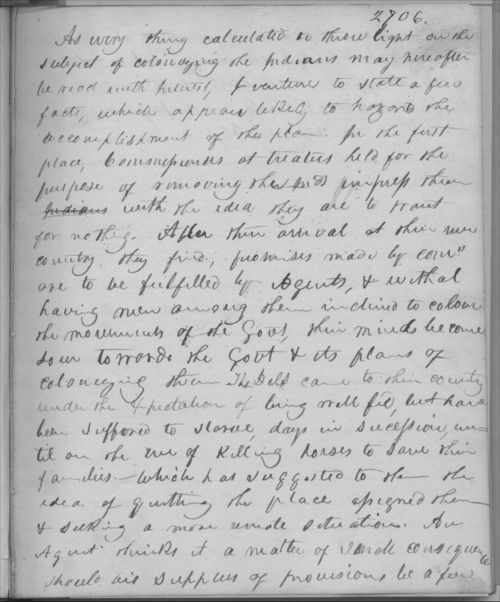 In this undated journal entry, Johnston Lykins, a Baptist missionary to the Shawnee of northeast Kansas, gives his perspective on how the U.S. government and Indian agents have treated emigrant Indians in Kansas. He also discusses how many of these Indian tribes are suffering from starvation. This brief entry gives a critique of U.S. policy from a direct witness (albeit a white one). It also demonstrates the disinterest of agents and the effects of removal on Indian tribes relocated to Kansas.